Square Enix has announced their lineup for the E3 that is taking place from 2 till 4 June. A couple of games that aren't present are the other Final Fantasy titles (Versus and Agito) and Kingdom Hearts: Birth by Sleep. Hopefully some interesting news will be revealed during the press conference of Microsoft, Nintendo and Sony. Yesterday Square Enix has announced that they will release a Limited Collector's Edition of Star Ocean: The Last Hope across Europe. The Limited Collector's Edition contains the Star Ocean Soundtrack Compilation CD, five Star Ocean: The Last Hope character cards, the 32 pages official miniguide from Brady Games and the game covered on 3 discs. Star Ocean: The Last Hope will be released in Europe on 5 June. Final Fantasy XI ported to PlayStation 3? 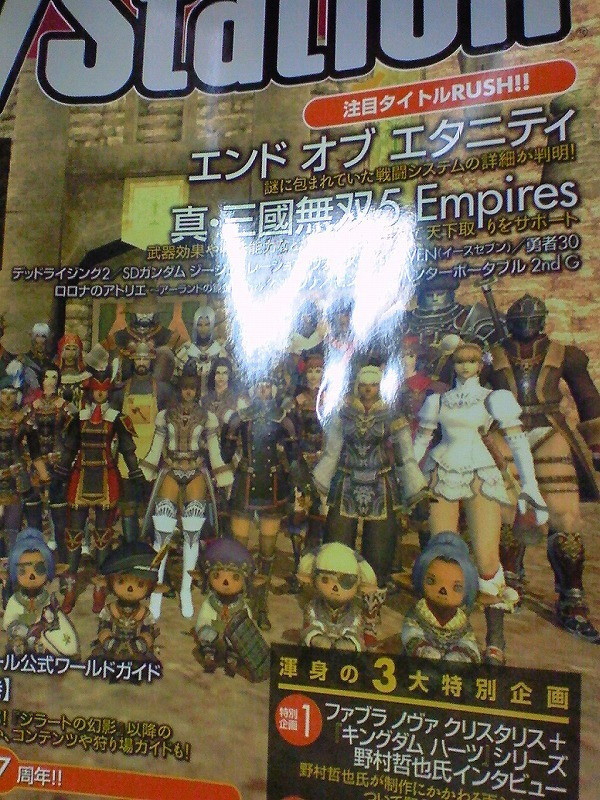 According to the latest issue of the Japanese Dengeki PlayStation Square Enix will port Final Fantasy XI to the PlayStation 3. Final Fantasy's MMORPG was released on the PlayStation 2 and PC back in 2002 and for the Xbox 360 in 2006. I think they're a little bit late with it. Official website Grandia Online launched! GungHo Online Entertainment has launched the official website of the MMORPG Grandia Online. On the website you can find information (in Japanese) and screenshots about the game and watch a teaser. If you've played the original Grandia you will be familair with the music playing. A couple of hours ago a press conference has been given to the Japanese press. When more information will be released I'll update the article. All we know is that the game is exclusively for PC and that GungHo has opened an one week playable beta. Sony has announced that they will release a Dissidia: Final Fantasy Limited Edition Entertainment Pack in the United States. The pack contains a mystic silver PSP-3000, Dissidia: Final Fantasy, Final Fantasy VII: Advent Children UMD and a 2 GB Memory Stick PRO Duo. The pack will be available starting 25 August at Gamestop and will have a retail price of $199 USD. It is unknown if Europe will also get this pack. Square Enix has announced that Star Ocean: The Last Hope hits Europe on 5 June. Square Enix took the time to translate the menu screens and subtitles into French, German, Spanish and Italian. I'm sorry for posting this kinda late. Things are a little hectic here lately. Square Enix is developing a new game? Square Enix has revealed a teaser page to a new game that they are developing. The URL is called mystery and the title says New Game. The teaser shows a science-fiction version of New York that is being attacked with a quote from John F. Kennedy.